Kit is unavailable due to manufacturer back order of Calgonate eyewash. Please see F40-347 or the new ANSI 2015 Class A version, F40-347A. Calgonate® Gel - Contains 2.5% Calcium Gluconate. Recommended first aid topical gel for hydrofluoric acid (HF) exposure to the skin. Calcium gluconate combines with HF acid to neutralize the powerful fluoride ion to prevent the extraction of calcium from the wound reducing burn damage to bone and deep tissue. Calgonate Emergency Eyewash is a convenient, sterile, pH-balanced solution suitable for first aid eye irrigation. 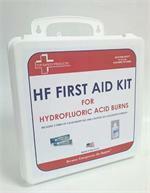 Introduced as an added measure of safety for people working in facilities using (HF) Acid. 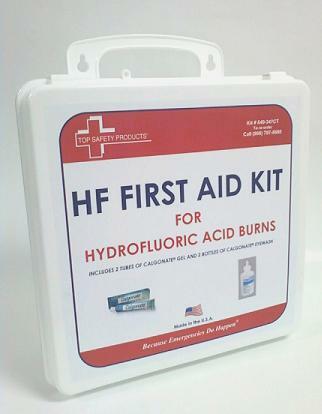 The kit contains the items most frequently recommended by safety managers in HF facilities. Comparable to Calgonate Emergency First Aid Kit CALG-TS043-KIT01 and exceeds Medi-First 89612, Grainger 11C644, Grainger 9KZK3. Contents packed inside a 24P, gasketed, weather resistant plastic cabinet with a carrying handle / mounting bracket. Calgonate® Eye Wash, 4 oz. Trauma Pad , 5" x 9"
Trauma Pads, 8" x 10"
Sterile Pads, 3" x 3"
Sterile Pads, 4" x 4"
IMPORTANT: ALL HF burns require medical attention, even when treated with products containing calcium gluconate. Photos are representation only; actual items may vary from pictures..
Price: Buy More & Save! Special Price for 12 Tubes Only $28 each + Free Shipping! Each Refill Kit Contains (2) each: Calgonate Gel & Standard Sterile Eyewash.